Its always fascinating to observe a trajectory of a brand, be it in beauty or in fashion, and see how things evolve over months and years. Having been charmed by a British clothes brand Fold since it was started a few years ago by Polly McMaster, who struggled to find suitable clothes to wear for her job in the corporate sector and hardly anything was available beyond the mousy and at times too masculine styles of jackets, trousers and dresses available at clothes retailers. Polly enjoyed fashion and wanted to dress to work in a way that enhanced who she was as a woman and not just a professional, enhancing her confidence, but not causing distraction for her colleagues and clients. 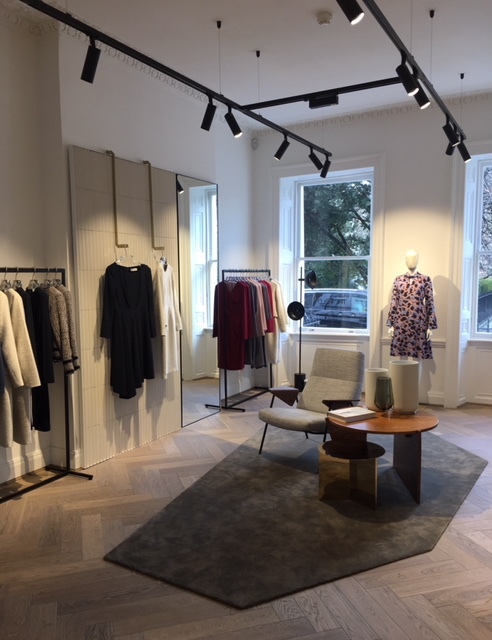 Having bought a couple of items from the brand in the past, I took advantage of a brief window of opportunity between meetings and dashed in to see their newly opened flagship in Cadogan Place in Chelsea this week. The store used to house Emilia Wickstead (whichoutgrew the premises and moved to Sloane Street five minutes away), where Fold now resides comfortably, next to lingerie Karine Gilson, Pretty Ballerina shoe and bespoke Anya Hindmarch stores (handy wardrobe and accessories shopping right next to each other). A beautiful ground floor space offers lots of natural light, flooding the showroom through the large windows and helping your choose the right colours to enhance your body shape, skin complexion and hairstyle. Wooden parquet floor, chrome railings, tasteful, but discreet artwork on the walls only enhance the understated elegance of the clothes. Not surprisingly this feminine, tranquil and welcoming space was designed by women for women by the Kinnersley Kent Design team. Fold spring edit focusses on stylish and practical solutions that will enhance your existing wardrobe and sense of style. You can choose from different styles of blouses, jackets in shorter and slightly longer length, skirts, trousers and incredibly chic and versatile dresses made from silk, tweed, wool blends, twill and jersey. Start with a dress, then add a few blouses, a jacket, a pair of trousers and you are ready to face the world, be it in the boardroom, in the office or during lunch or dinner meetings. Fold also offers sartorial solutions for day-to-night dressing, like their Pentworth dress with contrasting band and asymmetric hem made from multi-coloured Italian tweed that looks professional, yet feminine at the same time, something that as a woman working from home, I also appreciate. Sometimes to dress appropriately for school run, meetings and after school activities without having to dash home or into a gym changing room to change outfits isn’t easy, yet as I browsed the railings today, I caught myself dreaming and compiling a list of potential ‘looks’ in my head. With elegant, but not intimidating lines, almost architectural in their elegance folds, and zippers most of Fold clothes are timeless and will serve your well through seasons and years hopefully, something that I particularly value as a woman and consumer in our fickle times of throw away fast fashion. Clothes that enhance your style and parts of the body that you are most proud of, while folding subtly around those that you might not want the focus to be on, they become your comfortable armour in daily life, allowing you to work and play, while being comfortable. The store will also host events, like the one (sadly already sold out, so I missed my chance on what I am sure will be a very interesting conversation) that will take place on March 8th, International Women’s day, when Gaby Roslin will interview Sarah Curran MBE (founder of My-Wardrobe) and Whitney Bromberg Hawkins, former Gucci PR and now founder of immensely popular Flower BX single flower delivery service with a difference).